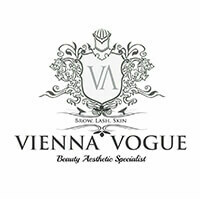 Step into the lush chambers of Vienna Voque located at Spazio @ Kovan. They sport gold and white walls, lacey golden curtains, and shiny decorative beaded strings hanging from the ceiling, that exude a grand and luxurious atmosphere in the establishment. Some of the beauty and wellness services they provide to their patrons include facials, eyelash extension, eyebrow shaping, and a variety of massages, such as aromatherapy, lymphatic drainage, and deep tissue.